Our Crossover Ladder and Platform Stairs allow your workers, contractors and visitors to safely walk over obstructions, hazards and barriers. These systems come in a variety of sizes and configurations designed to meet the needs of your facility. We can provide a configuration for all commercial and industrial applications. Typical applications are pipes, dusts, conveyors, conduit, HVAC, processing equipment, roof expansion joints, danger zones, traffics areas and parapets. Just provide us a few details using our Measuring Form, and we can provide a quote and CAD model for your Crossover Ladder or Platform Stairs. They can be customized to fit your application without any field modifications, and integrate into existing platforms, stairs, Ladder and equipment. We can provide any configuration, small, large, standard and non-standard designs. Your new product will make you OSHA complaint and allow workers to easily move around obstacles, hazards and barriers. Our Crossover Ladder and Platform Stairs are designed, engineered and Made in USA. They are available in a modular bolt together configuration or as a fully welded structure. All welds are completed with American Welding Society D1.1 and D1.3 Certified Welders. Our freestanding Crossover Ladder and Platform Stairs are fast to install without any fabrication, cutting or welding. Modular design simply bolts together with a few hand tools. Standard builds include stairs, Ladder, platform, bar grating, Safety Railing, toe boards and hot dipped galvanized finish. 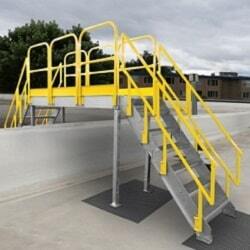 Easy to upgrade options are solid surface diamond plate for treads and decking, self-closing safety gates, and safety yellow powder coat for Safety Railing. Crossover Ladder and Platform Stairs can be either freestanding or attached to existing structures. Solid surface stair treads and decking, and toe boards help prevent tools and contamination from falling on process equipment, conveyors, pedestrians and mobile equipment. We can design and build a system for any application, here are a few of our styles: Elevated Workspaces, Elevated Mezzanines, Crossover Stairs, Crossover Ladder, Platform Ladder, Multi-Directional Platforms, Work Platforms, Raised Walkways and Inspection Platforms. For roof applications, Crossover Ladder and Platform Stairs are easy to install, freestanding and don’t require any roof penetrations. Open bar grating allows to water to pass through and hot dipped galvanized finish does not require maintenance painting.